If you’ve never been to a chiropractor before, you might have some questions about what care at our office involves. Your brain talks to the rest of your body by using the spinal cord. If there is a misalignment in the spine (subluxation), your brain and body aren’t communicating like they should. You’ll start to see pain and other symptoms appear. A chiropractor will locate and correct these misalignments with safe, natural chiropractic adjustments. Why is my nervous system so important? Every organ, tissue and cell in your body is controlled by the nervous system, which you can think of as a control center for everything in the body. By adjusting your spine, a chiropractor reduces interference in the control center, allowing your brain and body to communicate to their greatest ability. This optimal communication will allow your body’s natural healing abilities to take over, reducing pain and disease. After all, our bodies are self-healing organisms! Why would a baby need chiropractic? We recommend that babies see a chiropractor for a health checkup from birth on. The birthing process can be traumatic for a baby! Most of the problems we see in adults start in childhood, even in the process of a normal birth. A chiropractor can gently check to make sure there won’t be any lasting effects of birth trauma. As your child continues to grow, chiropractic can help to ensure that they’re able to grow and develop as they should. Dr. Pat’s children have all received chiropractic care since they were born. They continue to see him regularly and are all happy and healthy! Everyone’s body and health problems are different. Some patients may feel relief after just one adjustment, while others with chronic problems that have been present for decades may take longer. Dr. Pat will create a personalized care plan that’s tailored to your specific needs, so you’ll get exactly the care you need to start your healing as quickly as possible. When it comes to your health, we won’t guess. 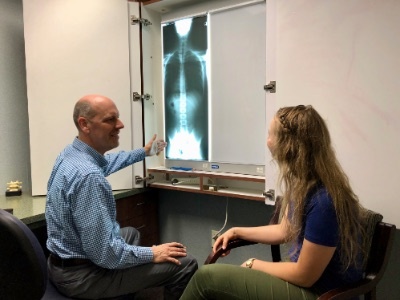 To see is to know, and X-rays will allow Dr. Pat to see the structure of your spine and pinpoint your problems. Once we know precisely what’s wrong, we’ll determine the best course of action for your individual needs. We’re ready to address any concerns you have—contact us today!